Thanks to Team Mom we were sent a Moon Dough Push N' Pop sample to try out. At first I wasn't sure if I wanted to try it out... we had some issues with the old version of Moon Dough... but I figured I would give it a go now that Moon Dough has an all new dough formula. 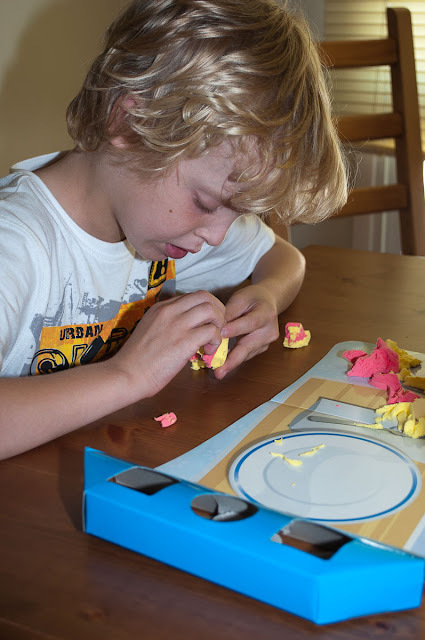 When the Moon Dough arrived my husband actually groaned and said "noooo! Not that stuff again!" so I figured I would give HIM the opportunity to review the brand new Moon Dough :). 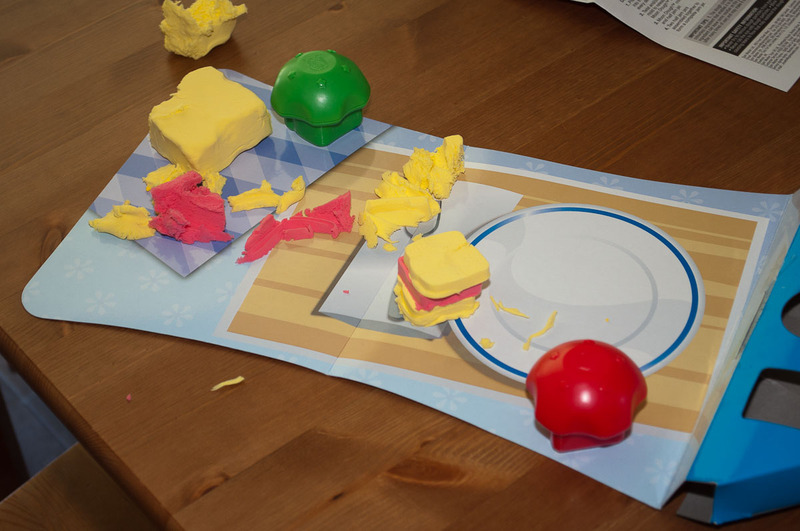 When we sent Moon Dough to review, I must admit to being slightly annoyed. 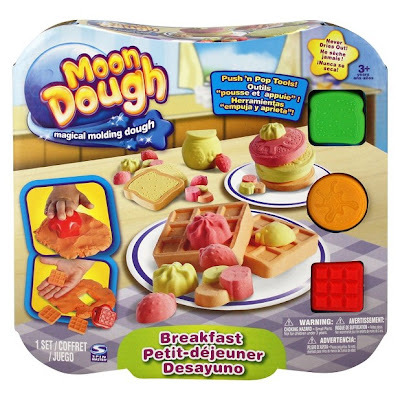 We have had Moon Dough in the house before and I did not love it. The kids enjoyed playing with it, however the note we received with this “Moon Dough Push N’ Pop” promised better consistency and that the dough was less crumbly. So I held out a glimmer of hope for the improved product. The kids came home from school and were excited to try it out. We set two of them at the kitchen table with it. <FLASHBACK> With the older version of the dough, the kids enjoyed it, but it seemed to go everywhere, it would seemingly crumble and go all over the place, otherwise it worked as advertised. However with the older version we didn’t really encourage the kids to play with it. Back to the present, they started playing with it. It was immediately apparent that this new formulation of the dough was much better then the old one. 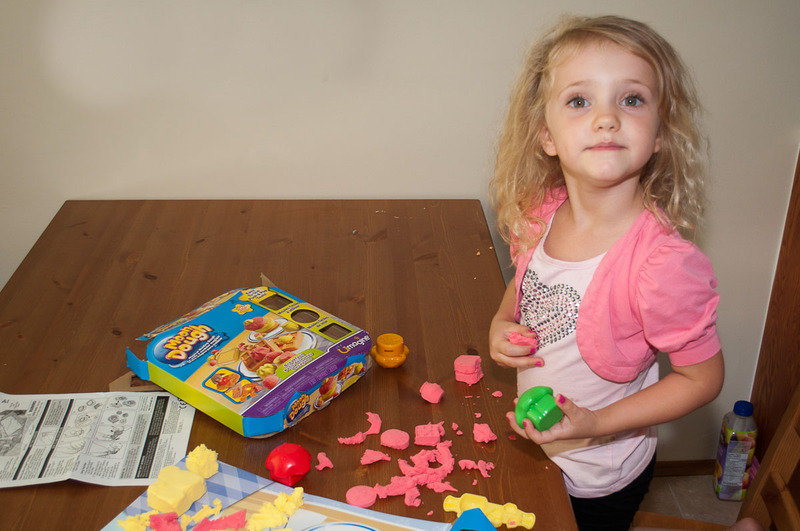 The dough formed well and Olivia in particular enjoyed making the food items included with the kit. I was very impressed with this Moon Dough. 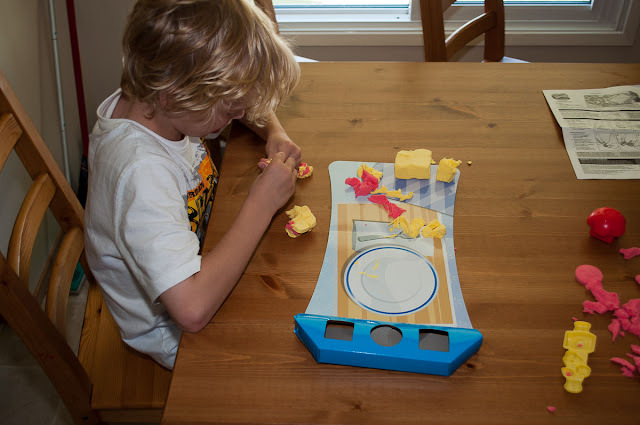 It worked just like it was supposed too, and more then that the new formulation of the dough shows a manufacturer that listens to parents input.